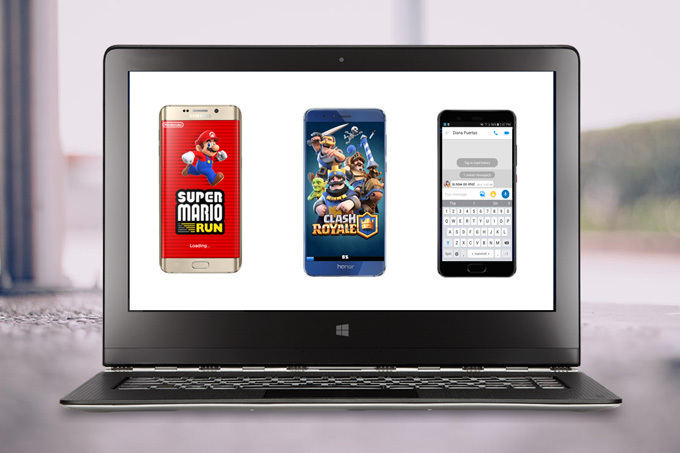 Many people have the desire of seeing Android phone content on a bigger screen, and it would be better for them if they can control their Android phone from PC. As we all know, displaying and controlling one Android device from the computer is available now. However, for people in some fields, such as education, YouTubers, etc, they may want to control multiple Android devices for better explanation or presentation. Yes, that is also possible, you just need to have the right tool. Below are the best programs that you can use. ApowerMirror is an app that helps you mirror and control your Android devices at the same time. With this tool, you can control multiple Android tablets and phones from your computer using the mouse and keyboard. Furthermore, you’ll be able to take screenshots of your phone and record every activity you do to your devices. If you use it for presentation, you can make use of its Whiteboard feature to draw and write something on the displayed screen. To manage multiple Android phones, you can follow the detailed steps below. Download and launch ApowerMirror on your Android devices and PC. Connect all Android devices to your computer using USB cables. If your mobiles pop up notifications asking for allowing USB debugging, choose “OK” to continue. On your phones, tap “START NOW” button and you’ll see your phones’ screens on the computer. And you can now start controlling your phones on your computer. If you don’t want to install an app on your computer and would like to mirror Android devices to Windows or Mac, Vysor can be a great alternative for you. 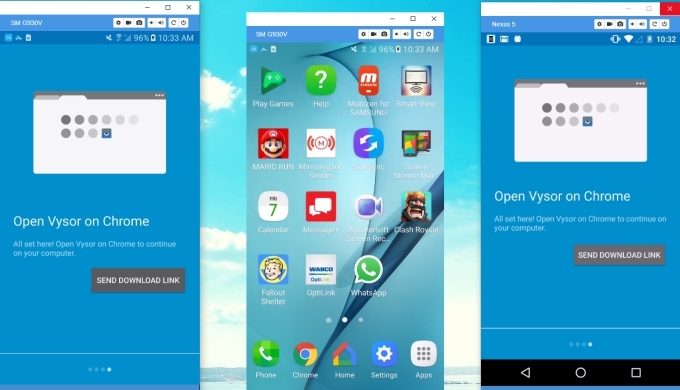 Vysor is a Google extension app which can display and control multiple android devices. With the step-by-step instructions, you can utilize this app easily. You need to download and save the application as an extension on your Chrome browser. Once the extension is ready, just connect your devices to your computer with USB cables and then Vysor will detect them. Click on the name of your devices and they will then be mirrored on your computer. What should you do if Vysor can’t find your Android? As using it, I once encountered a problem: even though I enabled USB debugging, the chrome extension app couldn’t find my devices. To solve this, please check the following solutions. Use the USB cables that can transfer data, because some cables are just for charging. Make sure you set your USB mode to PTP rather than MTP or Charging. On Windows, you need to download Universal ADB Drivers and launch it. 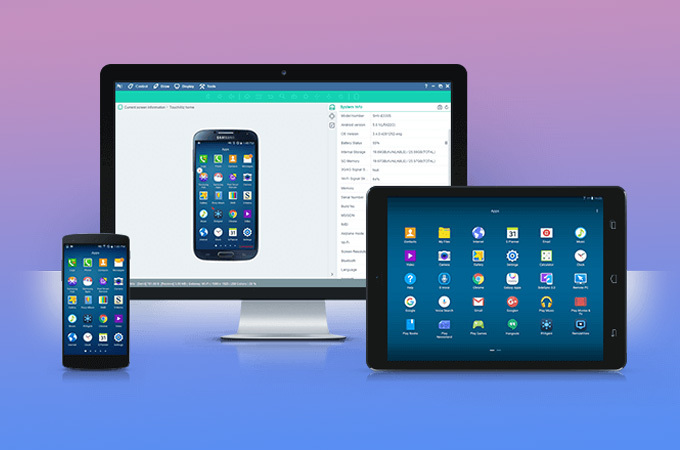 Now, you may control multiple Android devices from PC. However, at times, this app lags and its resolution gets low to the point that the screen gets pixilated. If you are looking for an application which can help you control your devices remotely, then you can use RemoteView. 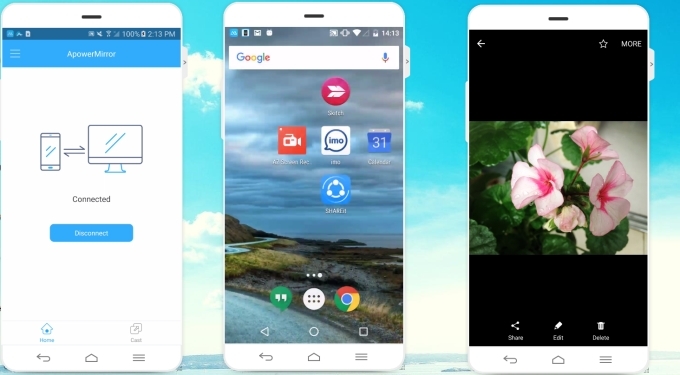 This app can let you manage multiple phones, computer. Better yet, you can remote control multiple Android devices. Actually, this application is perfect for businessmen so that they can access their computers or any other device they use. Teachers can also use this app for some classroom activities. Go to RemoteView’s official website, sign up and log in. On its interface, click a device and choose “Remote Control”. When the mobile screen shows up with its information, click “Control” > “Mobile Control” on the upper left corner. And then you can click the mobile screen to access it. This application is good but the only problem with it is that it sometimes lags and could not work without internet connection. All of the apps given above are very useful in most of the situations when you want to mirror and control multiple Android devices. You may use them in accordance to your needs. If you want to remote control your devices, you can use RemoteView. And for users who prefer to manage devices online, Vysor would be great. But as a user of those three, I recommend ApowerMirror for most of the users, due to the high resolution it presents and its very simple and user-friendly design in both interface and operation procedure. For a first time user, you will not have a hard time dealing with it. Aside from that, it can work via USB when there is no network. Also, it can use WiFi to establish connection wirelessly.